This sunday we decided to stay in and relax while watching a film. 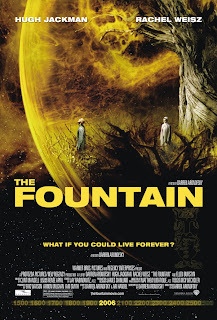 We chose "The Fountain". At first, I wasn't prepared to see such a film. This is the sort of film that not only makes you think a great deal but it also makes we feel like wanting to be in silence, quietly absorbing every possible idea it explores. It is by far a mind troubling work of art. If you want an easy film, do not watch it. If you enjoy films that make you think, explore numerous possibilities and still leave you with a feeling of unsatisfaction for not being able to fully unveil its significance... than this movie is for you. Wonderful performances both by Hugh and Rachel. His performance was, in my view, the most intense and complete as an actor I have seen from him so far. Her's I would state as equally good as her role in Constantine (2005), but perhaps more powerful and enigmatic. Ola!! brigada pla messagem no meu cantinho... na sextaa Fatima vai a' embaixada e logo perguntara!!! de qualquer modo... muito, muito obrigada!! Olá vim cá ter através de alguns blogs que ando a seguir e gostei .Ainda não vi esse filme mas pareceu-me interessante. Vou ver se o encontro. Obrigada pelas tuas palavras. És muito bem-vinda. By the way... és recém-chegada? Ainda bem, PsiPages. Obrigada por apareceres também. Beijinhos.